Not the most glamorous of purchases that you will ever make. However, it could be one that will transform the look of your premises and, at a stroke cut the cost of maintenance in cash and manpower to the absolute minimum. Poorly maintained and leaky fittings can devalue and cause serious damage to your property. 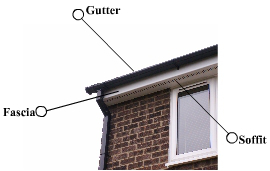 It therefore makes good sense to completely replace your fascias, soffits and gutters with new good looking and virtually maintenance free PVC-U fittings supplied by NuVu.